When we bought our condo last winter, we didn't realize we'd be moving into such a wonderful little community. We've been getting to know our neighbors over the last six months and we feel super blessed to be surrounded with some really great young families. What does this have to do with homemade ice cream? Just simply that great neighbors means more friends to share frozen treats with of course! Last month there was a week when we got strawberries and blackberries from my CSA (it's usually one or the other) and then when I took a trip to the local farmstand to pick up The Best Chips and Salsa Ever the owner just handed me a basket of raspberries with a smile. So with an abundance of berries in the kitchen came this delicious dessert. My friend and neighbor Liz had a birthday that week and this seasonal treat made its way a few doors down to her place along with her gift. 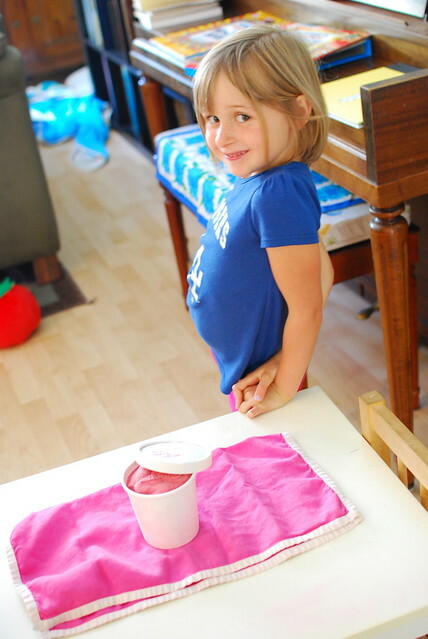 I adapted a recipe from David Lebovitz' book The Perfect Scoop to make my first ever batch of sherbet. Blend together ingredients with immersion blender (or in a regular blender). Strain seeds out if you prefer. Freeze mixture in your ice cream maker according to manufacturer's instructions. Blend together ingredients (4 cups of assorted berries (strawberries, blackberries, raspberries or your choice! ), 2 cups of half and half, 3/4 cup of honey (adjust this as necessary depending on sweetness of berries), 1 1/2 tsps freshly squeezed lemon juice (preferably Meyer)) with immersion blender (or in a regular blender). Strain seeds out if you prefer.